Drive engagement by associating with a cricketing extravaganza and provide a rich positive experience using gamification. The essence of Pepsi Road 2 Champions lies in connecting the fan with the game. Fans are given a chance to experience the game. The hub of the campaign is the microsite r2c.pepsiohyesabhi.com where you will have to register and sync your Facebook, Twitter and Instagram accounts in order to participate. Once you register with your details, you will begin your journey from Delhi. The journey will culminate in London where the fastest person to reach will be the winner and he/she will get to toss the coin in the final match. To win the race you will have to amass points by performing certain actions such as sharing cricketing moments in the form of pictures and videos. 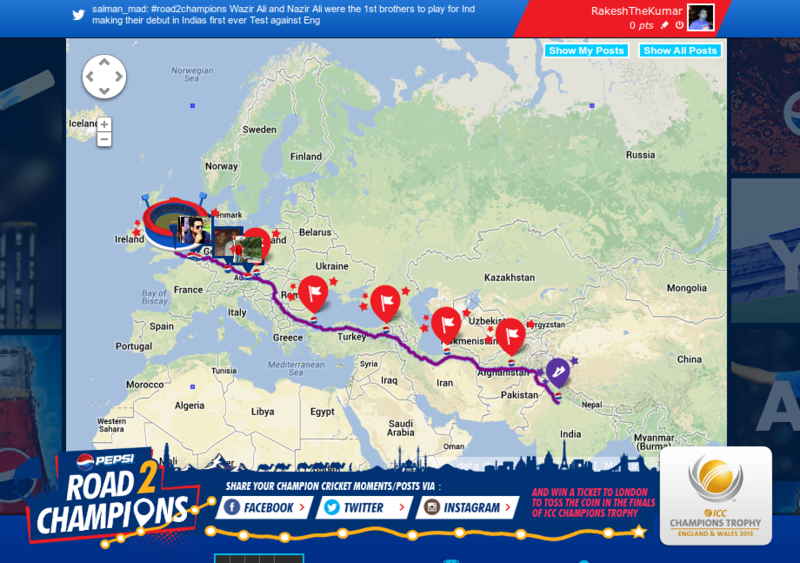 You can also post updates on Facebook, Tweet and Instagram using the hashtag #Road2Champions. After performing every action you will score some points. The fastest scorer will reach London first and will be declared as the winner. I like the way how it was kicked off in an offline influencer meet up. Bringing influencers under one roof and giving them an amazing experience offline will definitely give you a boost when they start sharing the experience with their online network. And it is refreshing to see Pepsi tap into Instagram. Not many brands in India have ventured into exploring this mobile-first social network. Also, having people generate content for you is the best way to engage them. If a person is investing his/her time and effort in creating content for your brand, it goes to show the affinity the brand has developed with the individual. And last but not the least, fantastic design. The UI is amazing and is really simple to navigate. In no place will you find yourself confused or stuck. While I am of the opinion that #Road2Champions is a great campaign, if I compare it with Pepsi IPL’s VIP Box Race, it shies a little. But in no way I am belittling this campaign, it’s just that the VIP Box Race seemed better to me. I am glad to see Pepsi India come up with such exciting gamification contests. And it’s refreshing to come across a contest that taps into a social network that is relatively unexplored.